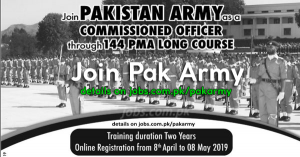 Join Pakistan Army as Commissioned Officer through 144 PMA Long Course 2019/20: Pakistan Army has announced registration for the 144 PMA Long Course for the year 2019/20 as the duration of the course is two years at PMA Kakul and the online registration are open starting from 8th April till 8th May 2019. 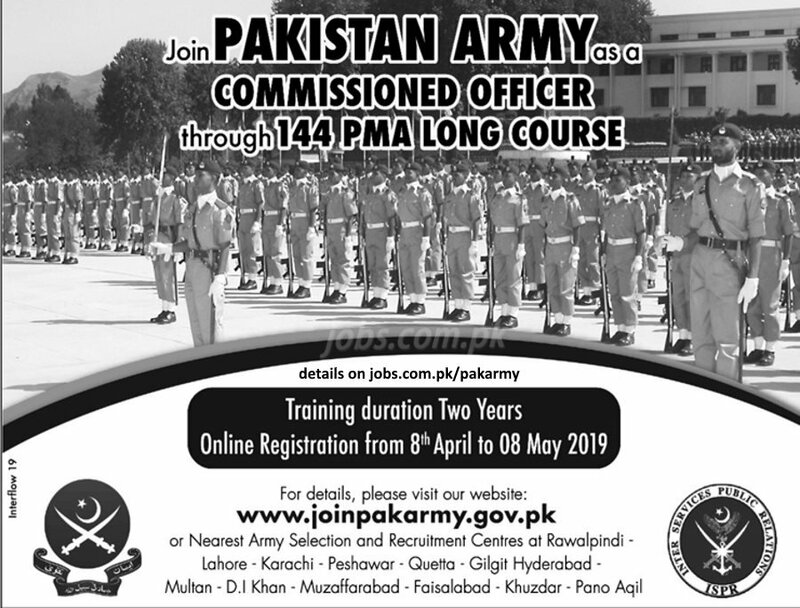 Below is the complete eligibility information along with qualification, age limit and physical standards as required to qualify for the 144 PMA Long Course as an Officer. Eligible candidates are encouraged to apply to the post in prescribed manner. Incomplete and late submissions/applications will not be entertained. To Apply online or get more information please visit the Pak Army website at www.joinpakarmy.gov.pk or visit nearest army selection and recruitment center as mentioned in the job notification below. Interested candidates must apply online on the Pak Army website or visit Army Selection and Recruitment Center (AS&RC) in various cities across Pakistan along with original documents, attested copies and passport size photos when visiting the center for registration.